Impressive, but why would you wanna put ’em on your face? Enzymes are a great exfoliator… it’s a bit more scientific than grabbing at some oatmeal and giving your face a scrub. Enzymes work by chemically loosening the glue-like substance that binds the upper cells on your face. These upper cells are dead, and their only reason for existing on your face is to provide protection from the elements. Obviously, that’s an important function in itself… but they pile up unevenly on your skin’s surface over time, giving an overall dull and uneven texture. As you get older, your skin’s ability to rejuvenate it’s cells begins to slow down… rejuvenation is the key to a smooth, even complexion. Without rejuvenation, that layer of dead cells gets thicker and thicker, making the skin appear duller. So, now we know what enzymes are, it makes sense to slather your face in something that is proven to “speed up chemical reaction in a living organism”. no? Let’s bust some dead skin cells! Amazonian Acerola Cherry, White Truffle Poria Cocos, Great Burdock, Erysimum and amino acids. Yum! I can’t decide whether I’d benefit more from eating it! I jest… although it does smell ah-mazing. There’s also mention of patented tri-enzyme technology… I’m not sciencey enough to give you the full low-down on this, but it basically means (google is my friend) that Elemis’ Tri-Enzyme products contain three enzymes (Subtilisine, Protease and Papain). These are the work-horses in the formula, and Papain is an enzyme found in papaya. How good am I at googling, seriously? So anyway, now that I’ve finished with the theory behind the product… does it do anything? I accepted this for review consideration because I’ve generally loved everything I’ve ever bought from the brand, and had heard great things about this product in particular. Though I must admit, I was also a bit nervous about using it. You’ve heard me go on about my redness and sensitive skin before, and I was worried that I would experience additional irritation from using this product. There was no need. 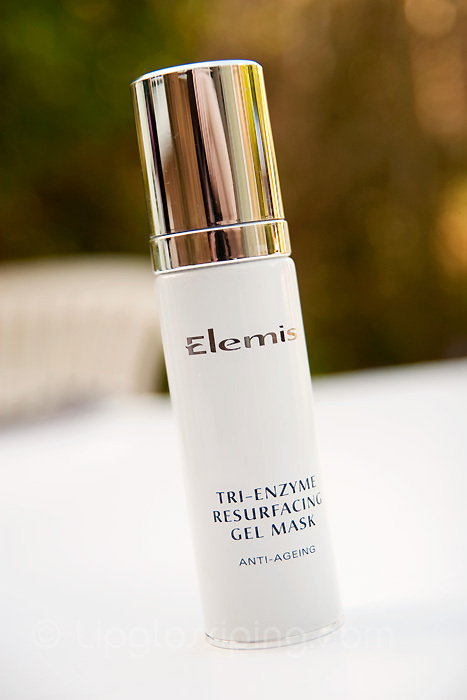 I find Elemis Tri-Enzyme Resurfacing Gel Mask really pleasant to use, despite warnings of a powerful tingling sensation. I feel a tingle… but less than most lip plumpers I’ve used. If anything, it’s quite a refreshing, cooling sensation. I wash my face and ensure that my skin is patted dry. Dispensing about three pumps of the Tri-Enzyme mask, I spread it evenly over my face, avoiding the eye and mouth areas. Then I go and put my feet up, or um… ok, in reality I go on Twitter. 10 minutes later, off I trot to the bathroom where a sink of warm water awaits me to wash the gel off. It doesn’t harden or crack and is easy to rinse away. It took 4 sessions (I’m using it twice a week) before I started to notice any real difference. It claims to improve skin smoothness, decrease the appearance of fine lines, blemishes and uneven skin tone. I dunno about all that but I’m definitely noticing a difference in the texture of my skin. I had some rough patches on my forehead and nose that foundation would cling to… these have disappeared. I hesitate to include the following observation (simply because it’s a real big deal for me) but I’m also sure that my redness has faded a little. Now, in all honesty… I don’t understand this, it was the last thing I expected to see an improvement with. The treatment room manager at Liz Earle mentioned inflammation as a possible cause for my redness, so I’m wondering if there’s something in the Tri-Enzyme mask that’s reducing inflammation. I should stop, because I’m totally hypothesising on this. All I know is that I’m not concealing my cheeks with pan-stick at the moment. They’re looking rosy rather than red. One last thing that I’ve noticed an improvement with is my pore size. I know that nothing can physically reduce pore-size, but I think that sloughing off the top dead layers of skin has had the effect of revealing my true pore size, which is definitely smaller than they previously appeared. Sadly, it’s done nothing for my nose pores or congestion in that area. I also haven’t noticed any decrease in fine lines. I don’t think it’s some miracle anti-aging product. But I think that it’s wonderful at sloughing away god knows how much dull crap from the surface of your face. So why not grab your St. Ives Apricot scrub and be done with it? Honestly, I don’t know… what I do know is that I’ve been using a facial scrub twice a week in the shower for over 7 months and haven’t come even close to the results that this has taken 3 weeks to achieve. Yeah, I like it. A lot. You can purchase Elemis’ Tri-Enzyme Resurfacing Gel Mask (£45) from the TimeToSpa website, alternatively (and more of a bargain) opt for the Elemis Tri-Enzyme Resurfacing System (£45) which not only includes a full-size mask, but also mini-sizes of the facial wash, night cream and a cleansing mitt. Oh, oh! One last thing, I nearly forgot… remember I said about those top dead layers protecting the skin from the elements? Well…. yeah, if you do use this – be sure to be super vigilant with sun protection (and I’m not talking factor 5), wear a hat… slip-slop-slap and all that. Your face will thank you for it. Amazing, so want to try it out, cracking review! I love this stuff. I get it from QVC in a Tri-Enzyme 3 peice set for about £57ish. It wont let me use the link here though bugger! As an esthetician, I’ll add that an enzyme mask, or peel, is much gentler than a glycolic or lactic acid peel, or even a physical scrub. I’d always recommend an enzyme peel for those who have sensitive skin or inflamed acne. Because the enzymes work on a microscopic cellular level, the degree of refinement is much deeper than your apricot scrub, and not nearly as irritating. Sounds like a great product, but the enzyme treatments you get in the spa are professional strength, so they are a bit stronger. This would still be great for home use! Does it only say “protease”? Protease is a generic term for a group of enzymes, which includes papain and subtilisin. Subtilisin was originally obtained from the bacterium Bacillus subtilis (hence the name), but similar proteases exist in other Bacillus species. I don’t exactly know how the dead skin cell layer looks like, but I’ll guess that there is some extracellular protein matrix that kind of binds those dead cells together a bit and these proteases help degrading that matrix. Then the cells can “loosen up” and be easily removed. I’m guessing the concentration of these enzymes in the product is very very low, or else you’d look like a zombie after a treatment :D.
Aren’t you happy you have a biochemist reading your blog… I’ll shut up now. @LeanneOCD – I see the one you mean, but when I click on it, it doesn’t work! @Estelle – Definitely, read what Diane says below you about the gentleness. I was expecting a much fiercer feeling from it! @Diane, @Patricia – I have the best freaking readers EVER! Truly, thank you so much for sharing your knowledge with us! 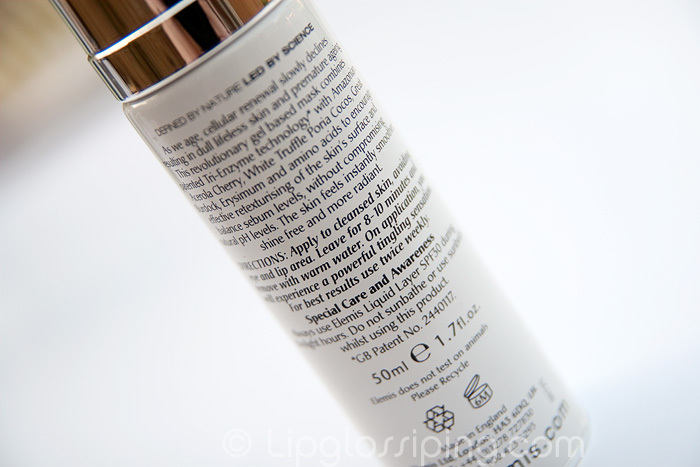 @Patricia, it lists those three names as the enzymes that ‘make up’ the tri-enzyme technology. Here’s a link – if you click on ‘how it works’ you should see them. Yes, I read that enzymes are quite tricky to get in the right concentration.. and that very low levels are needed in products like this. Ugh, you’ve given me a really horrible flesh peeling mental image now! I’m appreciating the subtlety of the mask even more HA! @Diane – That’s really useful to know that you recommend enzyme peels for sensitive skin, and it ties in with my experiences so thank you for clearing that up for me. Also delighted to hear about why it’s more effective for me than my scrubby scrub. Oooh I love it when things come together and make more sense. Thank you! @Rocaille – Oh if you do try it, please let me know what you think! @Lillian – I know Have you seen what Rocaille suggested? They’re on Etsy and I’m gonna try one when this is used up! Fact.. Im blessed with good skin. I’m never totally happy with it even when out the blue folk will compliment me. Fact.. I go for my saunas & steam pratically 4/5 evenings a week. It’s more to manage an aching in my muscles from a condition called Lupus but on the plus side I always use scrubs & oils… I got given a finger size tube & used it on Valentines night for my treat 2 myself at my normal night just going for a Spa sesh.. Not even the next day but actually with immediate effect my skin was just more than its amazing regular self. Even ME…who scrutinises my imperfections up to the hilts cos I can..even me who knows when my skin is behaving itself..I was amazed & excited at the results. Then with added effect of next day beauty routine.. Slapping on my boring makeup… Can’t tell ya how my skin just looked FiT! Yess indeed I fitted in2 MY perfect skin.